I often read content on my favorite magazine Verily or on other blogs that inspires me to write a post on With A Little Grace (cue Jenny's Valentine's Day post last week). Then, there is my cousins' blog, Castle, which inspired me to start my own journal in the first place! In fact, their blog is so inspiring, the priest that married Anthony and me even made it the central theme of his homily at our Nuptial Mass—and he had never even met Emily or Caroline! So, when I read a fantastic post by Emily about what it means to marry in the Catholic Church last week that was inspired by her sister and co-author's upcoming wedding, I had to share it. Below, Emily, a high school theology teacher, highlights how the intent of a Sacramental Marriage is for spouses to be self-giving—to lead each other to heaven—as I elaborated in my recent post about my husband, Anthony. Thank you again to Emily and Caroline for letting me share your work on With A Little Grace! (It is only fitting that I share this post on the day Caroline comes to visit me!) For readers looking for more faith content, be sure to check out Caroline and Emily's Catholic blog, Castle. 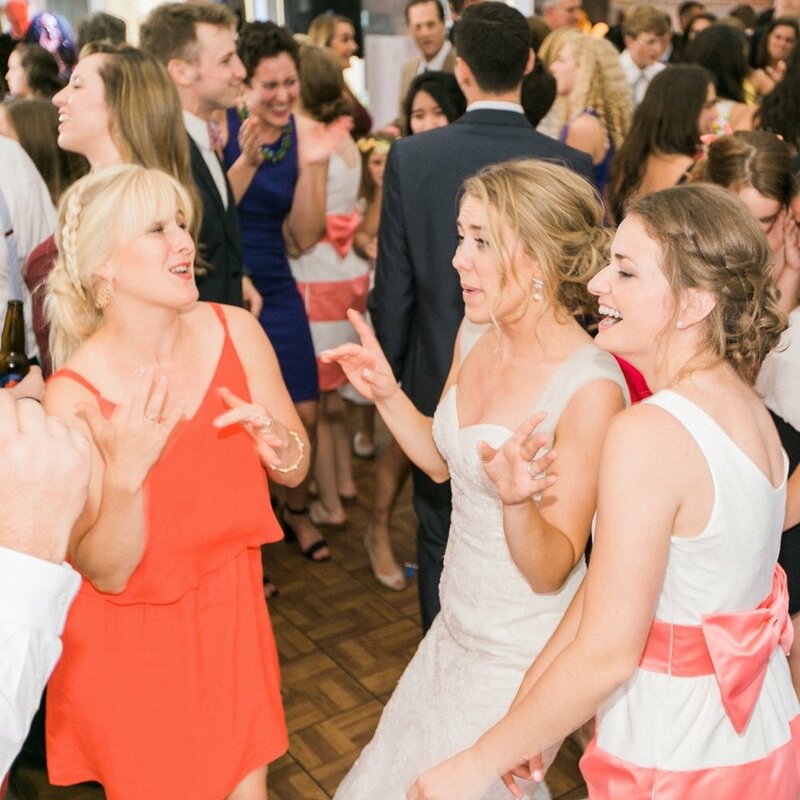 Emily, left, and Caroline, right, dancing with me at my wedding. Don't let their looks fool you—they are actually sisters! I know what you are thinking. She doesn’t ever want to get married? Is she becoming a nun? Didn’t her sister just get engaged? Is this blog actually Catholic? Is she seriously posting this on VALENTINE’S DAY?? Hold up. Just hear me out. Marriage is not for you. Wooaa. My marriage is for other people?? If marriage contributes to my salvation it’s kind of a bonus?? How incredible! This institution that is such a big part of our culture is really not about us at all! Think of all the questions we get about marriage…“who do YOU want to marry?” when do YOU want to get married? How many kids do YOU want to have? – Often we get this idea that marriage is for me; it’s purpose is to increase my happiness. Especially around Valentine’s Day, we are flooded with this idea of a romantic, warm-fuzzy love that elicits a reaction similar to seeing a commercial with a puppy in it. We see all of these romantic gestures, songs, and sweets that focus so much on what we GET from the relationship, the emotional satisfaction, companionship, and physical pleasure it gives us. While these are all good things, I think it’s important to call to our attention that real love – the kind that sustains a marriage – is not always warm and fuzzy. In fact, it requires a choice to love even when I do not feel like it. And that’s not a bad thing! Far from it. In fact, making a gift of ourselves, choosing to give our love freely even when it requires sacrifice and suffering, is the most beautiful and inspiring type of love there is. It’s what we’re made for. It’s what each of us desires and what each of us deserves as God’s beloved children. This is the meaning of life: to give it away. If you question this beauty, look at the cross. The love of Jesus is the most beautiful love story there is, and he wants that love for each of us. Marriage is the witness to that union he so desperately desires with us. Marriage is not for me, but hopefully one day it will be a gift from me, to the man that I love, and to the world. I hope you enjoyed this post by Emily, inspired by her co-author, Caroline! Be sure to check out their blog for more faith musings.